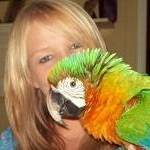 Parrot Forum • View topic - Video of Stitch talking! When we took our shower today Stitch decided to start chattering like mad, so I went and got my waterproof cellphone and filmed him. Here's one minute of his 15min of total chattering. and some random sounds he makes, an imitation of mister pretty bird from the youtube marnie-videos, as well as combinations of words from the above phrases ^^. He's hilarious, I hope you enjoy the vid! Re: Video of Stitch talking! His voice is a crack up! He sounds like a little kid. Adorable :] I totally will have to get a video of my beastie making her variety of noises and chatting. She whistles sooo much in the shower and very rarely anywhere else. I guess she likes the sound of water. Eurycerus wrote: His voice is a crack up! He sounds like a little kid. Adorable :] I totally will have to get a video of my beastie making her variety of noises and chatting. She whistles sooo much in the shower and very rarely anywhere else. I guess she likes the sound of water. Do that, its always fun with videos . Also, I cant remember if Ive seen your "beastie" before ^^, only read about her. So at least post a picture of her! Stitch's voice is pretty much his imitation of Marnie from youtube, he loves watching marnie's videos, they are his favorite even if he loves all parrot videos. Leroy on the other hand gets seriously pissy if he so much as senses that youtube is on in the room he's in. Thats just so cute He seems to be really enjoying himself. He also sings opera in the shower ! thank YOU! Ha ha ha! He's so CUTE! hahaha soo adorable! (: I like it when he says "hahahaha"